Born in Hartberg in 1981, she received her first cello lessons at the music school Hartberg with Mag. Inge Pfandner. In 1996, she moved to Graz University of Arts, Prof. Hildgund Posch, where she earned her first diploma in classical music in 2001 and her first diploma in IGP Violoncello in 2002. 2003/04 followed an Erasmus study in Stuttgart, after which she continued her studies in Oberschützen with Prof. Tobias Stosiek and finished with the Magister artium in 2004. Scientific curiosity led in March 2007 to work on a dissertation within the framework of postgraduate studies. In October 2009 she decided to study the Baroque Cello at the Conservatory of Vienna with Mag. Jörg Zwicker and, since March 2012, the Viola da Gambe with Pierre Pitzl. She has also studied with Christophe Coin, Patrik Demenga, Tobias Kühne and many others. 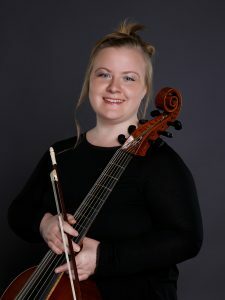 Her musical activities include playing Soloconcerts (Savaria Symphonie Orchestra, Pöllau Music Orchestra, Jugendorchester Hartberg), as well as participating in various ensembles and orchestras (Dommusik St. Pölten, Steichquartett with Wolfgang Redik, Musica Coelis Graz, Hartberg Chamber Orchestra, Sinfonietta Pöllau. ..). Since June 2006 Magdalena Kelz has been teaching at the music school Pöllau – Vorau – Joglland and since 2014 at the music schools Oberwart and Oberschützen.